Home radiators are warm and cozy, but they can also be unattractive space-wasters. With their exposed fins, radiators have a unique ability to attract and trap dust, cobwebs, and cat toys. Because they are permanently fixed in place, they stymie many floorplan changes. And because their metal surface can reach up to 215 degrees Fahrenheit, few items can be placed on them. Radiator covers are the solution to many of these woes. Radiator covers mask the fins while allowing the passage of heat. Because most covers have elevated tops, the covers' tops are significantly cooler, and this allows select items to be placed there. Even heat-sensitive items like plants can be placed on a well-insulated radiator cover. Instead of purchasing pre-built radiator covers, many homeowners decide to create do-it-yourself radiator covers. Few materials are involved, costs are low, and building techniques are basic. Common materials are wood and metal, but sometimes soft materials such as a cane, fabric, and string are used. Some DIY radiator builders recommend using medium-density fiberboard (MDF) as this dense, synthetic wood composite will be more stable when subjected to the radiator's heat spikes. Radiator cover or art? It's hard to say when this project is left in the hands of a skilled craftsman and furniture designer such as Jason Muteham. Sleek laminated wood in cherry, ash, and oak wraps seamlessly from top to bottom. Based in Bekesbourne, Kent, Muteham makes other versions where he applies primary color Formica-type laminates atop the wood for a contemporary look. For your DIY radiator cover, take a cue from this eye-catching string art cover made by Boston design house Sandcastle. The yarn is interwoven in delightful patterns on the inside of the radiator cover frame. If you decide to do it yourself, be sure to use natural yarns such as cotton, wool, or linen to avoid the possibility of scorching or melting with manmade fibers such as acrylic. Cane was practically made for building your radiator cover since it's a great visual shield yet allows heat to pass through—lightweight, inexpensive, and easy to handle. Cane webbing comes in sheets or rolls that can be stretched across the front of a radiator cover frame. Home blogger Chez Larsson recommends first soaking the cane in water to make it softer and more manageable. This DIY radiator cover's poplar wood top isn't just a beautiful design choice. Since wood is a poor transmitter of heat, it provides a cool top for plants and curios. The MDF frame directs heat through the center opening. The stamped aluminum grille conveys heat to the room and hides the radiator. Home blogger Christina of Christina's Adventures kept the build super-simple by gluing the grille to the MDF frame with heat-tolerant Elmer's ProBond Advanced, supplemented by a few staples. What if your radiator cover could do more than hide the radiator? A long, deep shelf tops this DIY radiator cover, by Familjemix with louvers directing heat toward the room. Bordering spacious picture windows, the radiator shelf gives indoor plants a chance to bask in the sun. Or add cushions and turn it into an instant window seat. This simple DIY radiator cover is more about adaptation than construction. Though bespoke furniture maker Deanery Furniture built this table specifically as a radiator cover, you can similarly make your own. Begin with a tall, narrow table called a console table, making sure that it is high and deep enough to span the radiator. If the table has a lower leg brace, notch it back deep enough to accommodate the radiator. Many console tables are sturdy enough that lower braces are not necessary. Twenty vertical hardwood slats seek less to hide the wall-hugging radiator than to provide a charming visual distraction from it. This DIY radiator cover's L-shaped members run from the window sill to a footer attached to the hardwood flooring. Made by Design-Milk, it has pillows topping the radiator cover offer a toasty seat on a chilly winter's day. One disadvantage to some radiator covers is that access is hampered since the cover must be lifted straight off the radiator. New York City-based custom millwork and furnishing company 3F Living solves that problem by adding hinged doors to the front of this cover, permitting the homeowner access to the dials and knobs. For your do-it-yourself radiator cover, elevate the doors about 1-inch above the cover frame to allow neat placement of a perfectly sized seat cushion. Some radiator covers call attention to themselves by their craftsmanship and beauty. Others aim to disappear. When your home is built into a circa 1750 dairy barn in Denmark, you typically don't want to show off your radiators. That's why this design company One Kindesign blended in the radiator cover with the shelving unit, rendering the radiator nearly invisible. You can bring this look into your home by creating a wall-length built-in shelving unit that incorporates the radiator. Just make sure to provide generous buffer room on all sides of the radiator to allow the heat to escape. Pallet wood's cost ranges from free to extremely low-cost, so it's a natural building material for a DIY radiator cover. Extremely versatile, pallet wood has been used to make everything from side tables and kitchen backsplashes to ceilings and bookshelves. 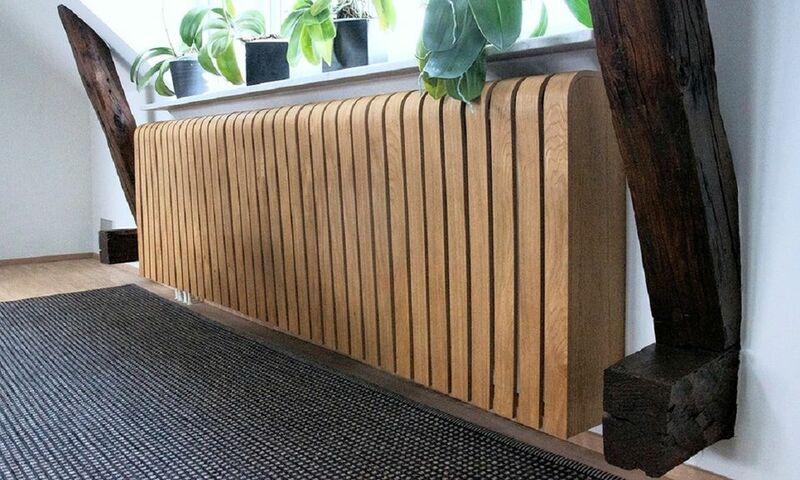 In this design by Lantiv, the narrow profile of the wood pallet is perfect for tucking away a radiator. Wide slats transmit a maximum of heat to the room. You can find wood pallets alongside the road in industrial areas (be sure to ask the business if you can take them). Be cautious of pallets that formerly held food, chemicals, or petroleum-based products. Spills can be hard to remove from the pallet wood. If not thoroughly removed, these spills may emit noxious smells when the radiator heats up.